Rogue- a brewery of greatness and of letdown. The price tags on the bottles never seem to be worth what is inside. For bottle collectors like ourselves, Rogue would seem like the perfect brewery for us to have all their neat artwork against our wall. But who seriously wants to pay twelve dollars for a 22 oz bomber of an imperial ESB that weighs in at 7.2% ABV? 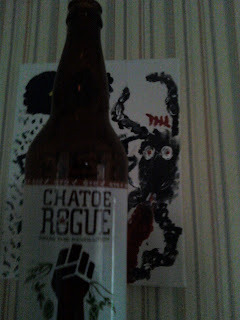 Rogue, you seem to have gone astray, please let your decently priced Dirtoir Black Lager win us back. RCRFGDBL (seriously?) pours jet black with a carmel head and smells like a chocolate stout or porter. It has a light to medium body that leaves your tongue much like a porter but with a slight chalky fuzziness. It hits your pallete like a sweet stout with no traces of alcohol. The finish is just okay- it's not missing too much but there could be more on the back end. We wish there was a little more warmth to the beer. Not all beers need to be imperial, this one just begs for a bit more bite. We are impressed by how delicious this lager is. There is no idication, other than what is written on the bottle, that this is a lager. It is very comperable to a sweeter low alcohol stout and it would battle up there with the better of those styles. We are very pessimistic towards the word LAGER, but these guys found some strange ale yeast that fermented on the bottom for some reason. Wherever these guys found this magic yeast, let's hope they can utilize it in other bombers that costs less than 10-16 dollars.